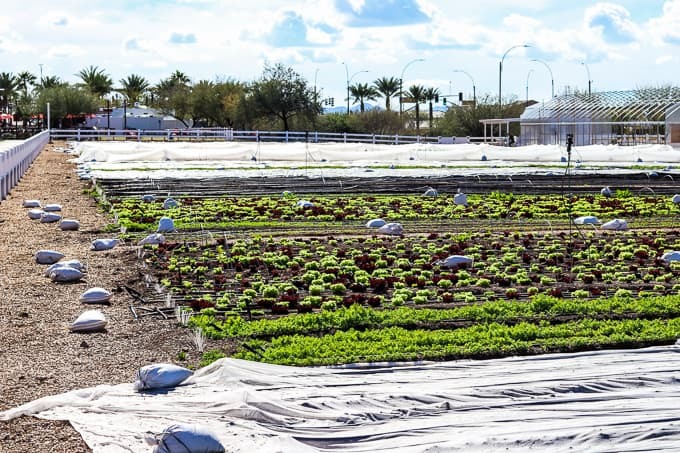 On a visit to Steadfast Farm, a market and micro farm in Mesa, AZ, I was able to learn how Erich Schultz grows food for the community and some Phoenix area restaurants on just two acres in suburbia! Today, I’m excited to be partnering with Farmland. They have been nourishing families across America with their great-tasting products since 1959. 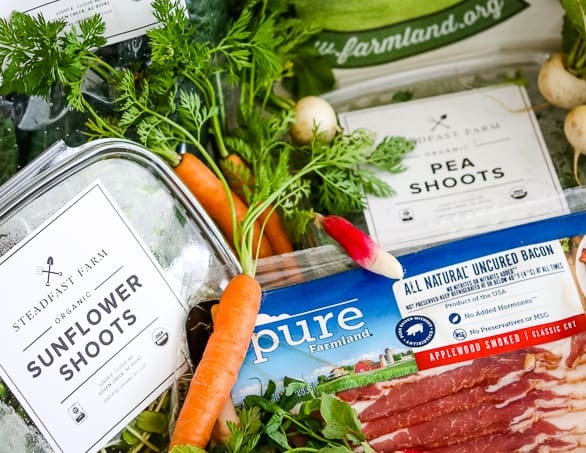 Knowing that people are now looking for healthier meal-planning options, their new Pure Farmland product line was created with the consumer’s well-being in mind. These products are all natural, contain no artificial ingredients, preservatives, added hormones, or MSG. In conjunction with American Farmland Trust (AFT), whose mission is to “sustain the land that sustains all of us”, they are preserving farmland, promoting sound farming practices, and supporting farmers and ranchers. 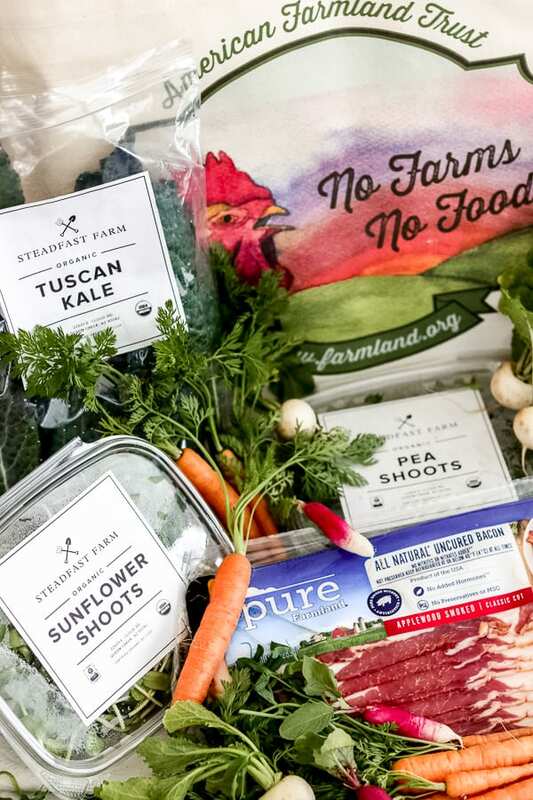 Now through December 31, 2019, Farmland has pledged to protect one square foot of American farmland for every specially-marked Pure Farmland item purchased, up to $140,000! Do you realize that EVERY meal on our plates contains ingredients grown on a farm? Therefore, sustaining the agricultural backbone of America is vital and everyone can help. I am proud to be partnering with Farmland in association with American Farmland Trust to bring you this sponsored post. I have been compensated but as always all opinions are 100% my own. It is always a great honor and privilege when I get to visit a farm. Each time I visit one, the work ethic and dedication of each farmer never ceases to amaze me. It is their way of life, their livelihood. 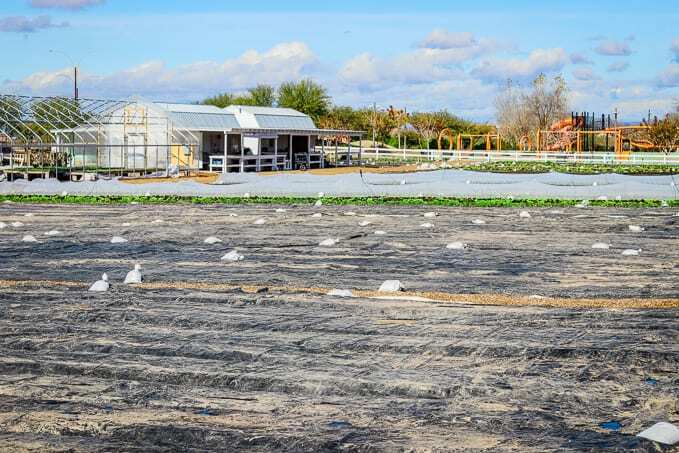 Some are born into it, and others such as Erich Schultz of Steadfast Farm, a market and micro farm in Mesa, AZ, choose to embrace it wholeheartedly as a new vocation. SAVE THIS STEADFAST FARM – A FARM TOUR TO YOUR FAVORITE PINTEREST BOARD! 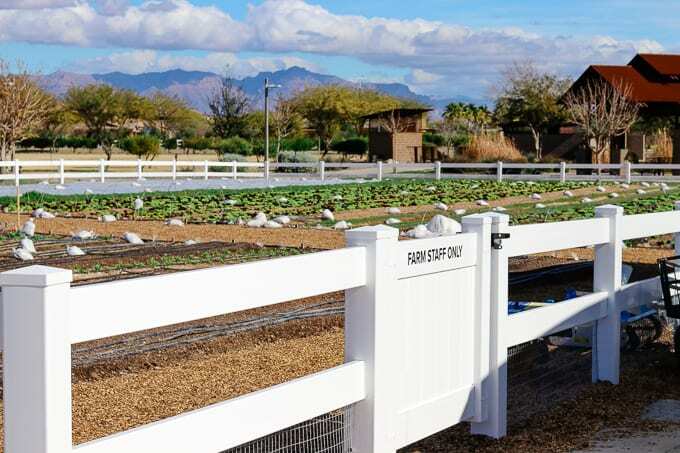 Years ago, Erich, who has a career background in high-end residential and commercial landscape design, became involved in designing a few projects for Agritopia. 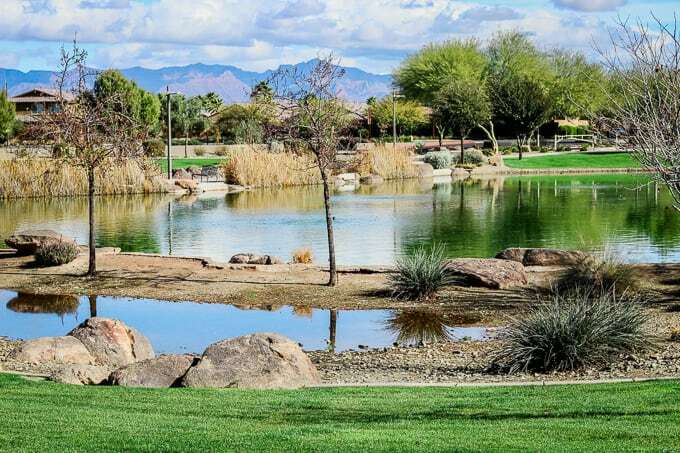 It is a residential community surrounding 22 acres of working farmland in Gilbert, AZ. After completing those and wanting a life change, he decided to take over the Agritopia farm, working to make it more efficient and productive. Throughout the years, he was able to do just that. Eventually, he decided to scale down for a simpler life, leasing just two acres of land in another community. 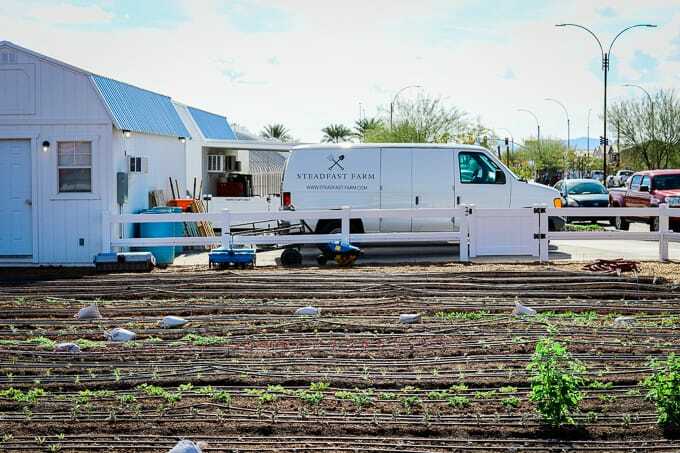 Ultimately, this organic, micro market farm called Steadfast Farm was born. 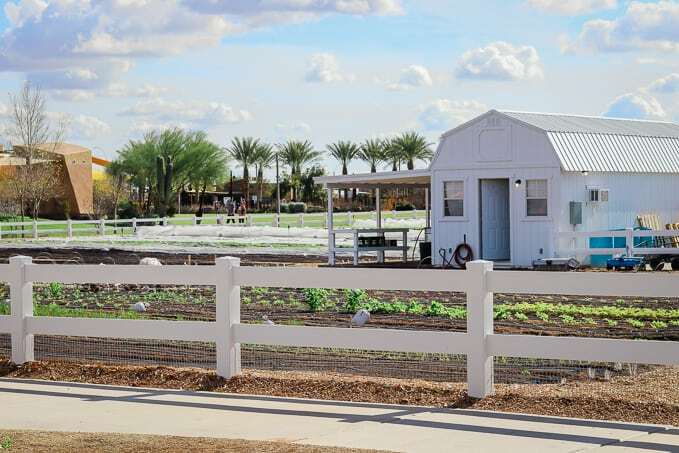 When I think of Phoenix, AZ and the cities and towns that it encompasses, a “farm” is definitely not the first thing that pops into my head. I’m thinking dry, hot asphalt, plenty of big office buildings and lots of homes really close together. 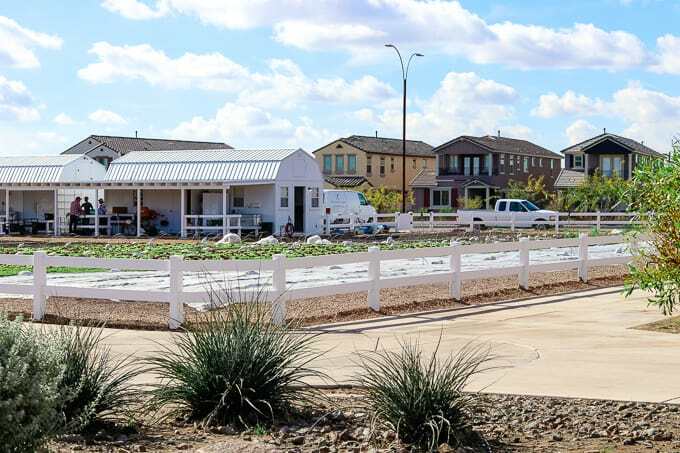 But Erich’s done it and right in the middle of Mesa, Arizona surrounded by what is to ultimately be 15,000 homes and the largest community park when completed. There’s just something so wonderful about visiting Steadfast Farm. It’s a peaceful, profitable and living piece of property smack dab in suburbia! 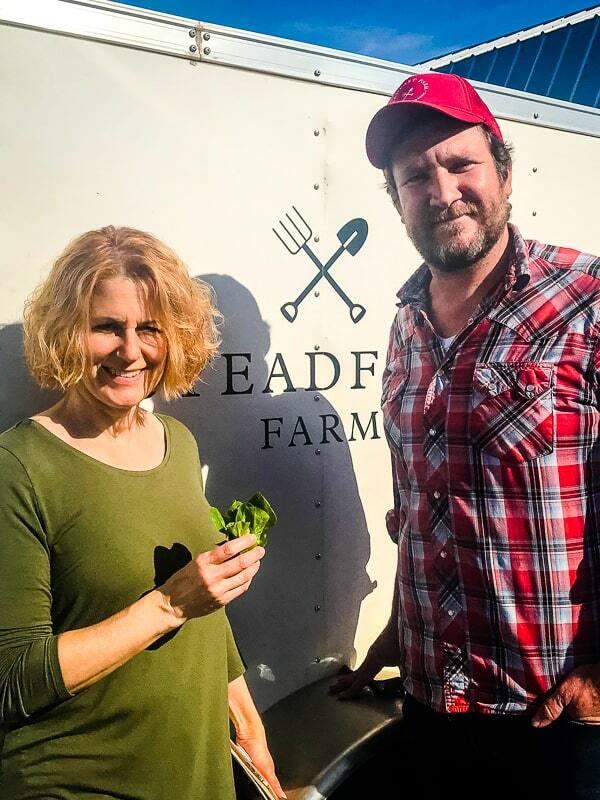 It’s amazing and I’d love to see more of these micro farms incorporated into many communities around the U.S.
Erich has worked very hard to make this “the smallest farm with the highest yield” and one that “specializes in baby vegetables”. It was built in two months and uses no large mechanized tractors, only one which you can walk behind. A big John Deere would dwarf this little bit of land, and they use minimal tillage so as not to disturb the soil. 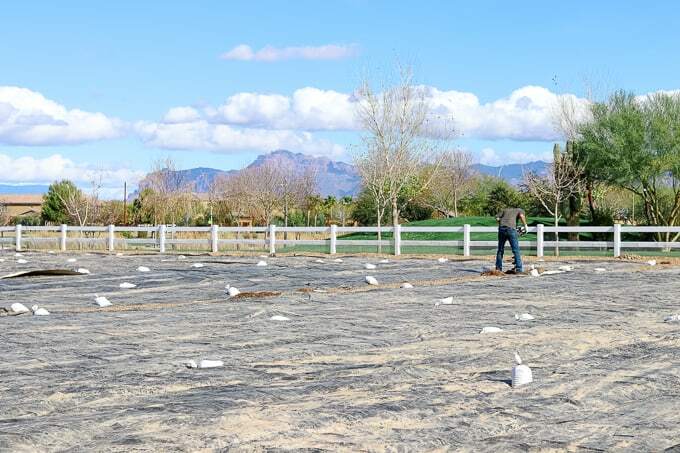 Using the walk-behind tractor pictured above, 10 rows of carrots are able to be planted in a 30-inch bed as opposed to a mechanized farm tractor planting just two rows in the same space. Consequently, because of such efficient systems and methods, they can do 10-20 acres of production on just a two-acre lot! Soil health is extremely important and Erich is aware of that. He works with nature, not against it, paying close attention to the needs of the soil. It is fed accordingly with compost, fish fertilizer and compost chicken manure. 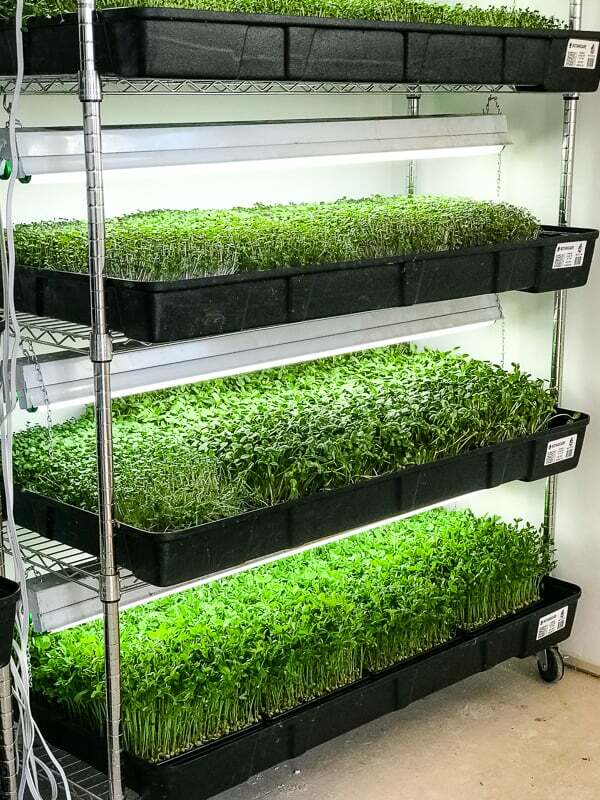 He grows micro-greens which are greens harvested about two weeks after planting. They include (pictured below and from the bottom going up) pea, sunflower, arugula and kale, and broccoli. Once planted, they are placed under a 24 hr. grow light, and at harvest one rack will produce $500 worth of greens. Not only that, but they were super delicious! 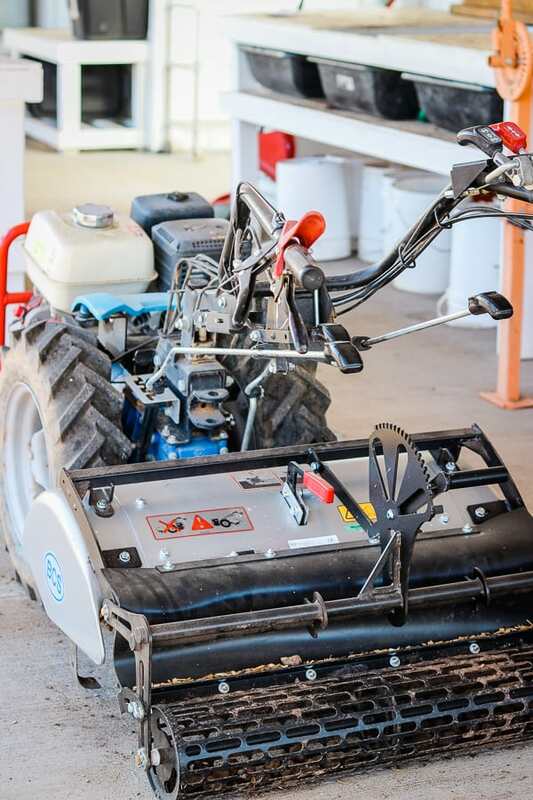 It’s in Erich’s nature to solve problems, so using the proper tools and machinery to be more labor-saving and cost-efficient is important, too. 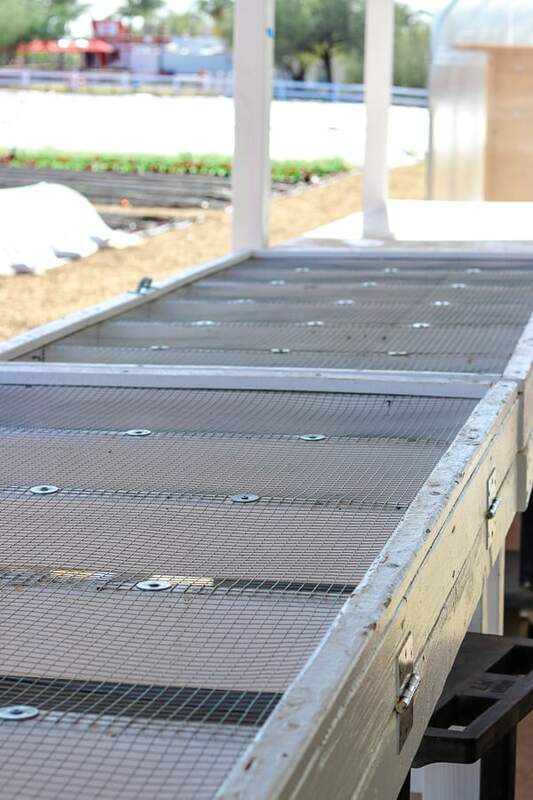 When it came to harvesting the micro-greens, he discovered that one man in 20 minutes could harvest what it took 2 people 4 hours to do just with the purchase of one particular machine. They say that necessity is the mother of invention and it’s definitely been put to use here! There are two horse water troughs, but no horses in sight. 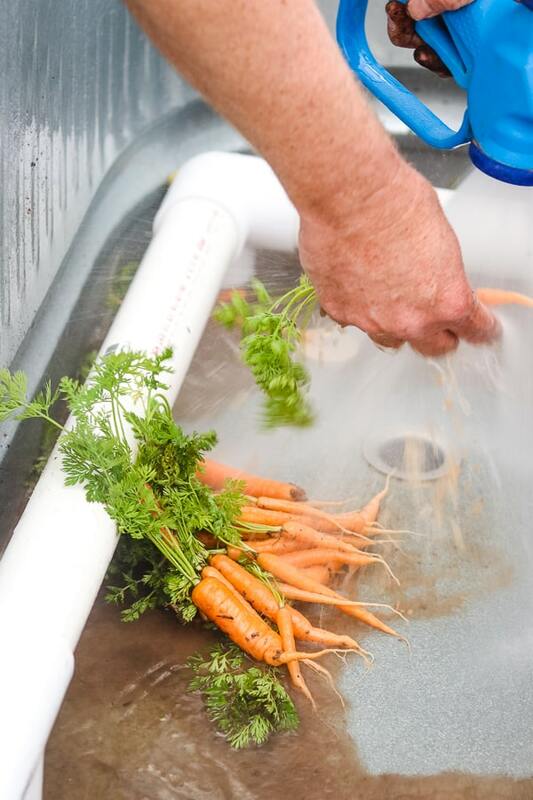 In each of these, there is PVC piping with small holes to create an “air bubble bath” to gently wash the produce. 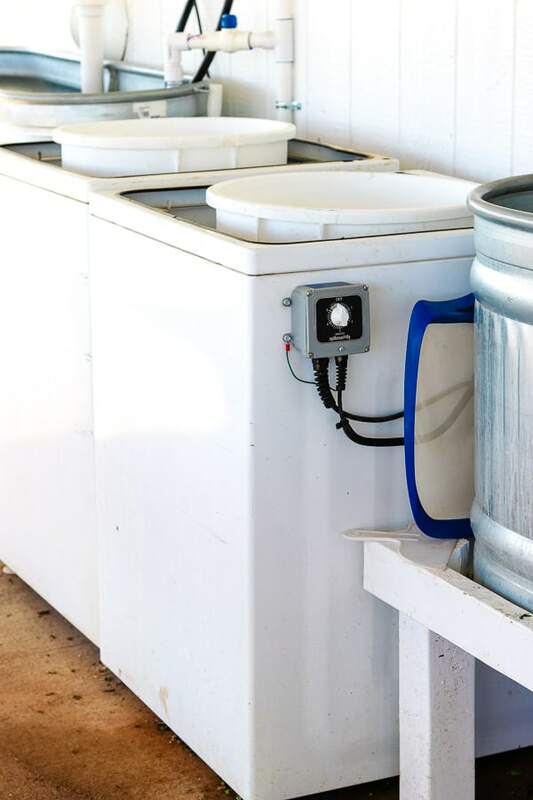 The greens are then placed into one of the two full-size washing machines that have been reconstructed with large, holed plastic tubs. 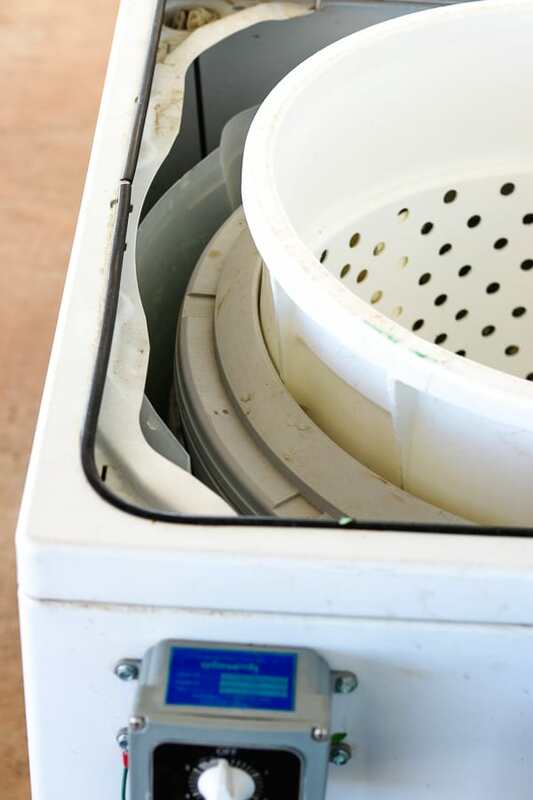 On the spin cycle, they drain the water much like your salad spinner at home does. After they’re spun, they’re placed on these racks where box fans built into the rafters above gently blow to completely dry them off. 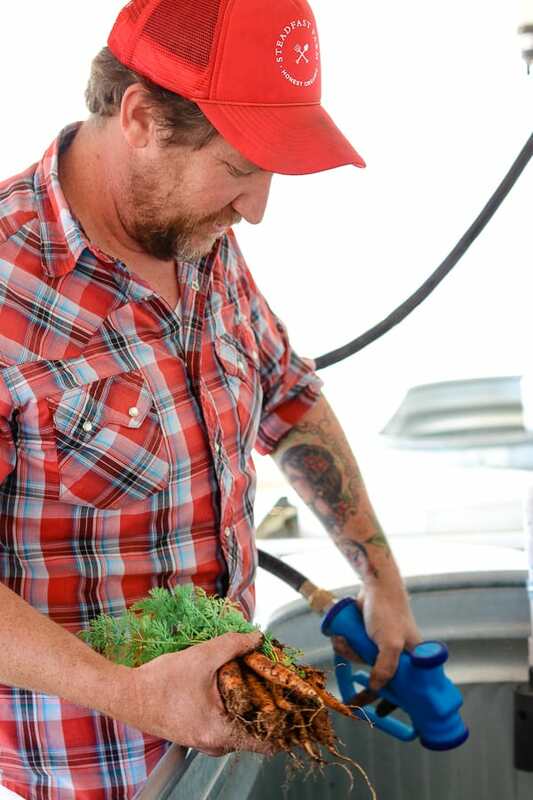 Customers have told Erich that because of his methods, the salad greens can last up to 3-4 weeks in their refrigerator! MUCH different than what you might purchase at your local grocery store, right? Conservation is important here on the farm, too. 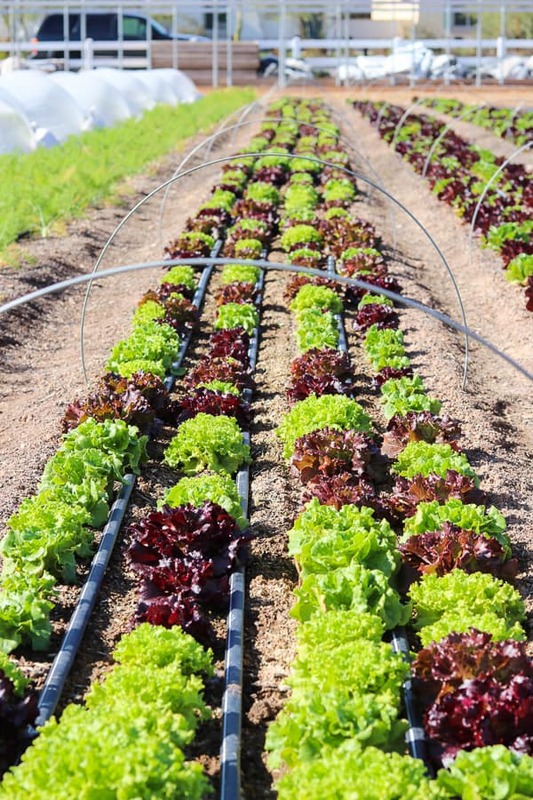 Only 1/10th the amount of water is used by the incorporation of a drip system, and micro sprinklers which water the crops from above. With a detailed plan, Erich can rotate 6-7 crops each season. There is a Fall/Winter season and a Spring/Summer season with the peak being April. 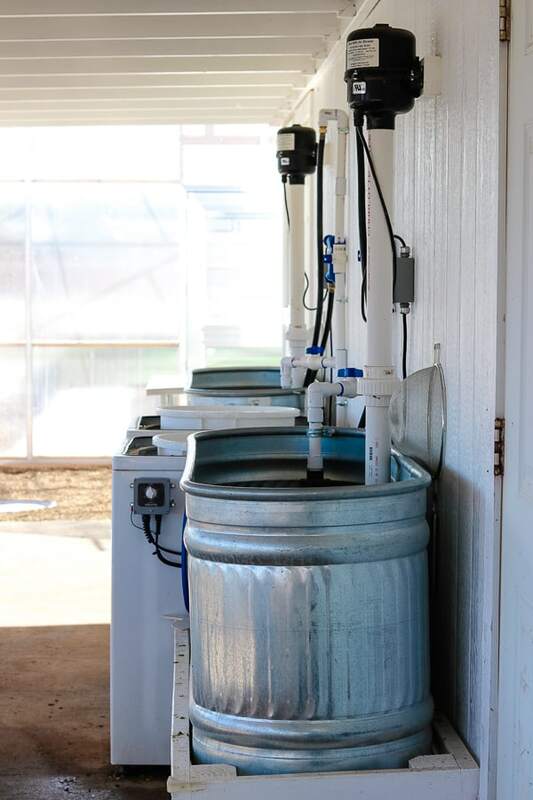 Because of the triple-digit temperatures and cost to water during the summer months, the farm is closed during July and August. This downtime is also important so that he can spend quality family time with his wife and three children. A farmer can work 24/7 because there’s so much to do and the dedication they have to their farm is exemplary. Time away is imperative. To Erich, personal balance along with having a good strong work ethic is extremely important. He is honored to be growing food for people to eat while at the same time being able to provide for his family. 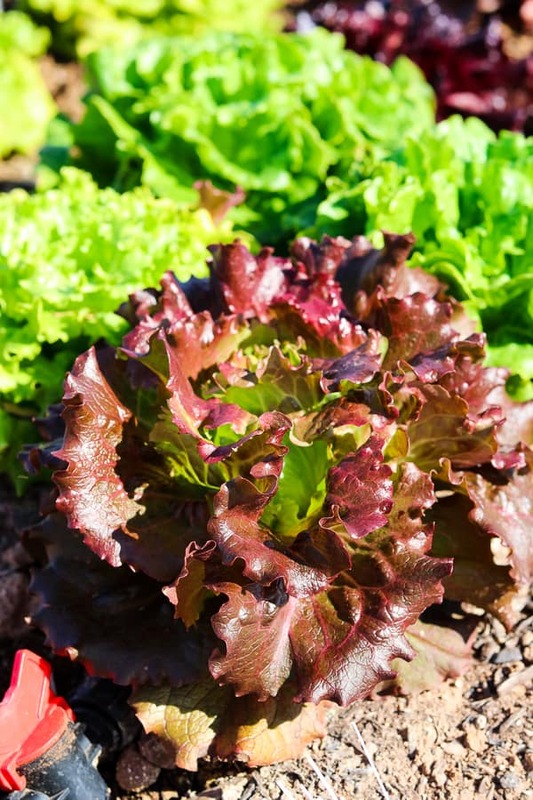 Here, they grow vegetables such as red and green leaf lettuce, carrots, radishes, baby kale, Mizuna which is an Asian green, baby turnips and more. These are crops that there is a demand for and can do well in an Arizona climate. 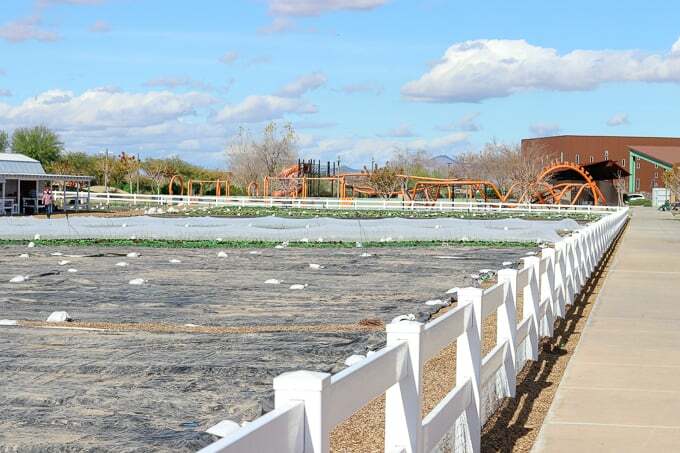 They are able to provide produce each week for 4 farmer’s markets and 25-30 Phoenix-area restaurants. 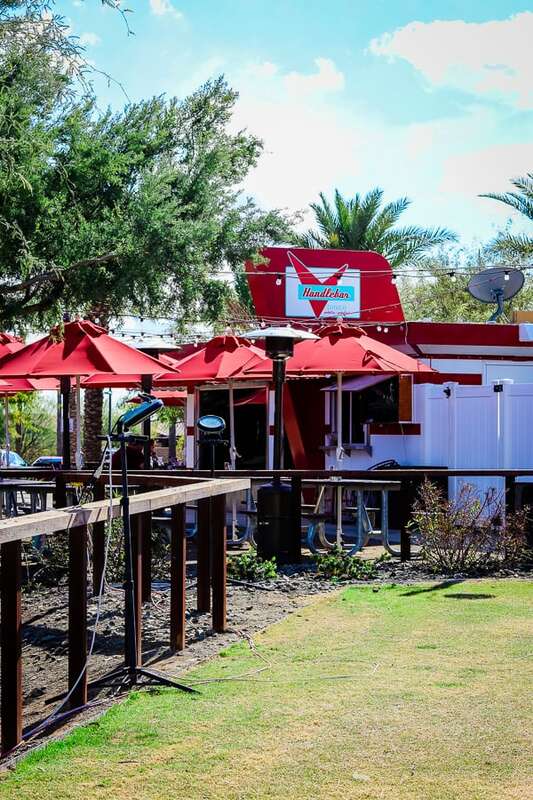 One of which, the Handlebar Diner, is located right next door to the farm. It serves delicious salads (I know, I ate one!) and food using Steadfast Farm produce. Steadfast Farm is also funded by a Community Supported Agriculture or CSA. 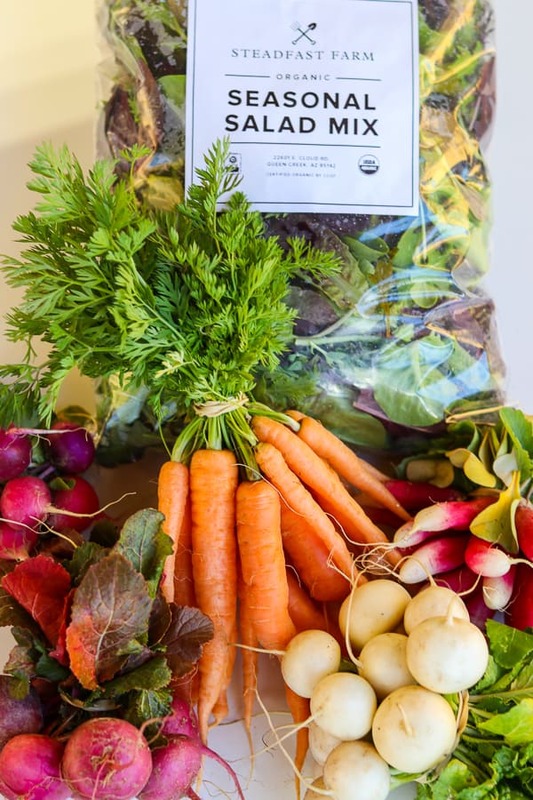 A CSA is an arrangement where people pay a fee in advance of the season to provide the farmer with capital to run the farm. In return, the farmer then supplies those members with a portion of the harvest. At Steadfast Farm, there are 100 families who participate. 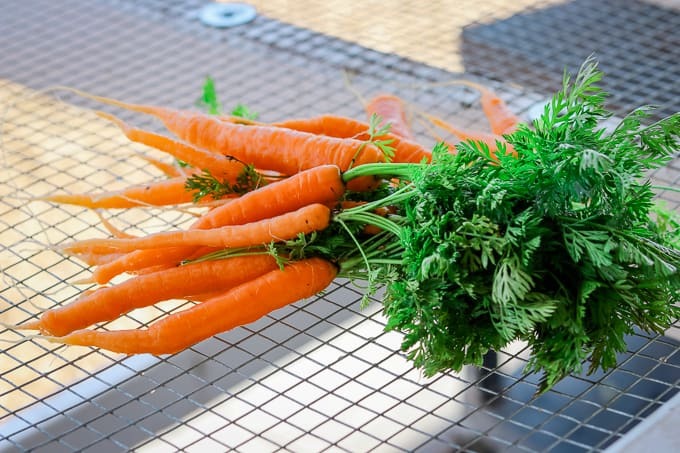 The curated box which is based on the freshest availability is given to them on a weekly or bi-weekly basis and can be picked up at 17 different locations throughout the Phoenix area. To me, a CSA is a win-win, and I’m going to join one! Micro Farming in growing communities is definitely an option for those farmers who want to do what they do best. Leasing smaller areas of land can prove to be more profitable. Erich is also a consultant, giving his knowledge to those who want to build a small-scale farm and/or use a portable/modular farming system. He’s helped a few farmers around the country. Providing farmers with the resources to work their farms efficiently thereby creating the most profit, preserving their land and encouraging conservation are ways to ensure that America will continue its’ sustainable agriculture. This is where American Farmland Trust comes in! What is American Farmland Trust? American Farmland Trust (AFT) is an organization that began in 1980 to protect farmland, promote quality and efficient farming practices, and to keep the farmers on their land. They are also strong advocates for conservation and are determined to preserve land, soil, and water. Did you know that “over 175 acres of U.S. farm and ranch land are lost every hour“? That’s 3 acres every. single. minute. Frightening, isn’t it? It scares and saddens me to think that farmers are losing the precious land on which many not only work but live. It is their livelihood and for many, has been in their families for generations. The incredible connection farmers and ranchers have with their land, good farming practices, and the work they do is all intertwined. AFT is the only national organization which recognizes that. Sustainability is SO very important. How can farmers who are running out of land and resources continue to provide not only for the consumer but for their own families as well? How can the needs of society continue to be met when there’s such growth in population? As I see it, farmers are truly the backbone of America. They nourish us and I hate to think where we’d be without them. Learn more by visiting American Farmland Trust to see how you can help. Support your local farmers by participating in their CSA. Take a farm field trip and see all that’s done on a farm and learn more about how the food we eat goes from farm to table. Purchase specially-marked Pure Farmland items so that you can help Farmland save American farmland and help American Farmland Trust further their mission. OF MY LIVE FB VIDEOS, SHARE RECIPES AND MORE! I’d like to thank Erich for allowing me to visit his farm and share his story. Also, many thanks to American Farmland Trust for the work that they do throughout the U.S. for our farmers and ranchers, and Shawn Shepherd, the West Coast director of AFT, for accompanying me to the farm. And last, but not least to Farmland for giving me this great opportunity to learn more about farming here in my own backyard. 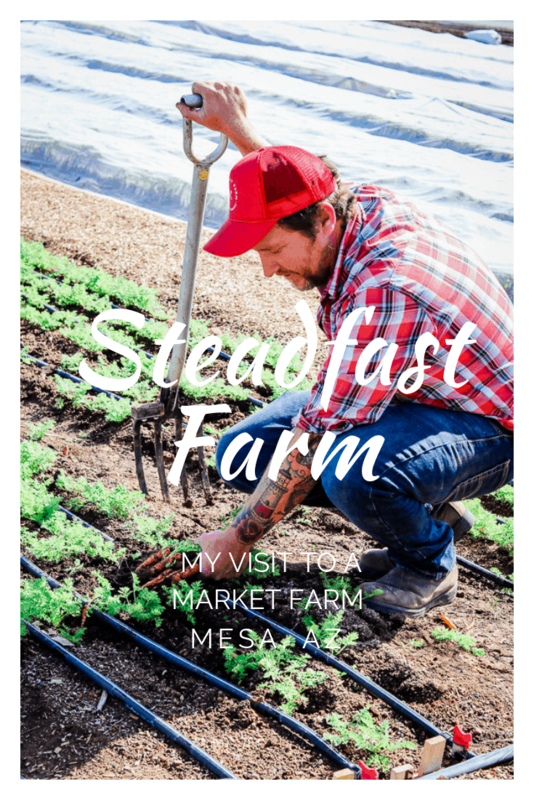 Be sure to look for some upcoming recipes with Farmland, with one inspired from my visit to Steadfast Farm!